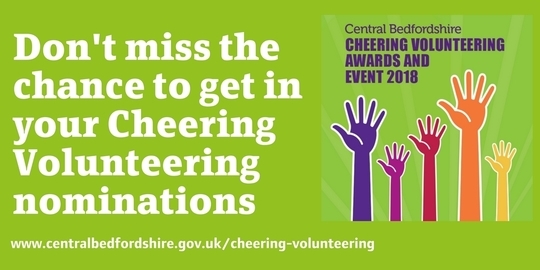 Nominations for this year’s Cheering Volunteering Awards close on Monday (16 April). If you are yet to put forward someone for an award, then please do so before it’s too late. It’s the nominations and the stories of the work our volunteers do which make this such a brilliant event, so please do take a few minutes to make a nomination and say thank you. The easiest way to do so is by filling in the short, online form. There has been an excellent take-up of free tickets for the event, which is again taking place at the Grove Theatre, in Dunstable, on Tuesday, 5 June. Make sure you don't miss out by securing your seats online now or calling the theatre's box office on 01582 602080. This year’s event will have a new compere too, with the multi-talented Aaron Spendelow taking the mic. Aaron is a local actor, presenter and performer who has done a huge range of exciting work, from appearing in a couple of Harry Potter films to performing with Adele and dancing with Anne Widdecombe as the Genie in Aladdin last Christmas. Thanks to Aaron for agreeing to compere the event after three great years with Billy Lee at the helm.